SIRANE’S popular steam-cooking bag range was on show at Seafood Expo North America in Boston earlier this week as our US partners Elkay Plastics showed off their Ready Chef Go! brand. Ready Chef Go! 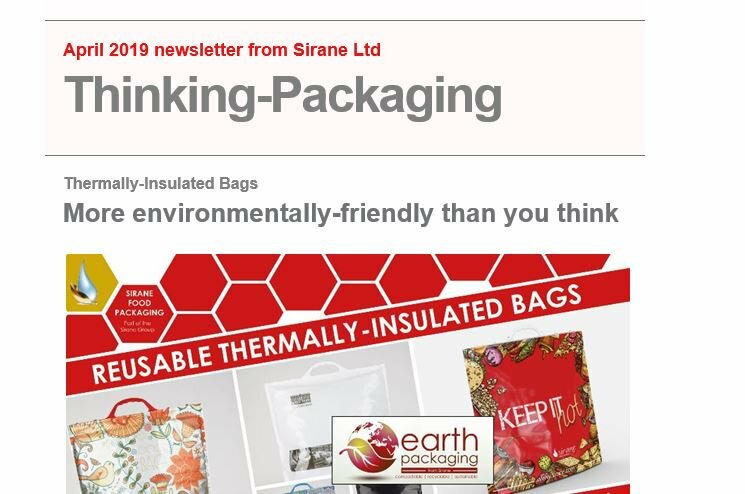 uses a range Sirane’s steam-cooking bag solutions of offer grab & go ready meals, and it is proving hugely popular with consumers in North America. Elkay Plastics – Sirane’s exclusive distributor in the US and Canada for self-seal steam cooking bags and oven/BBQ bags – devised the Ready Chef Go programme in order to offer grocery stores a complete package which would allow them to grow sales. Simon Balderson, Sirane MD, said: “Ready Chef Go! is a fabulous concept, and is perfect for seafood, so it was great to see our bags given pride of place on their stand. They look great, the meals look appetising – and more importantly, I know they taste great. Options for the oven/microwaveable steam-cooking bag range include multi-compartment, self-seal, heat-seal and stand-up pouches. Elkay offers a range of sizes and colours. Simon Balderson, Sirane MD, said: “This multi-compartment format is great for retailers. It allows the two (or more) compartments of the bag to be filled separately – and sealed separately. There’s no contamination from one compartment to the next, and they don’t even need to be filled and sealed at the same time, or indeed in the same production facility. “Of course, they can be – over the counter you could add fish with a marinade in one side, and vegetables in the other, making the perfect ‘over-the-counter’ ready meal. “But there’s also possibilities for pre-packed meals where fish, for example, is added on one site, that half of the bag is sealed, and then vegetables added elsewhere and sealed. “Whether it’s for production reasons or to keep the food separate, because the contents need different cooking times or just because it looks more visually appealing, there’s lots of reasons why a cooking bag like this might be the answer to your problems. “It’s possible to supply the two compartments with a tear-off perforation, allowing them to be separated by the consumer – different cooking times are no problem, or if the customer wants to cook one in the oven and one in the microwave there’s no problem. “Our steam-cooking bags are versatile – if you want a stand-up bag, for in-store display purposes, then it’s an option, if you want custom print in your own brand, it’s an option. Sirane’s steam-cooking bags allow all the flavours to be sealed in for simple, tasty cooking – perfect for healthy cooking and portion control, without sacrificing flavour. Once sealed by the retailer, the customer just puts the bag in the oven or microwave and cooks – it’s that easy. With our standard steam-cooking bags both heat-sealable and self-seal versions of the bags are available. Bags can also be supplied printed with custom branding. We’ve also recently added a stand-up version of the steam-cooking bags – allowing retailers to pre-pack the bags and present them to the customers in an attractive way. The bags are designed to be used safely in a conventional oven at up to 200 degrees celsius, in a microwave - and can be frozen for subsequent reheating and eating. Our steam-cooking bags can be used as a retail counter bag – but are also available in retail packs so that users can buy the bags and use them in a way that suits them. We also offer them in individually-packed sachets, allowing the bag to be included as part of a meal kit, for example, where customers put the food in the bags themselves. In addition, Ready Chef Go! offers access to a range of flavoured butters and marinades which allows retailers to easy turn seafood and meat into a tasty ready-meal. Seafood Expo North America, which is held annually in Boston, Massachusetts, is the largest seafood show in North America. Karl Heggarty, Sirane sales manager responsible for seafood packaging, visited the show this year, and spent time with the Elkay team as well as walking the halls. He said: “Sirane offers a wide range of products perfect for the seafood market, including the steam-cooking bags for oven/microwave. It was great to see Elkay giving our cooking bags such a good showing, they’re great for cooking seafood and fish, and are very popular. For more information, visit www.sirane.com or call +44 1952 230055.